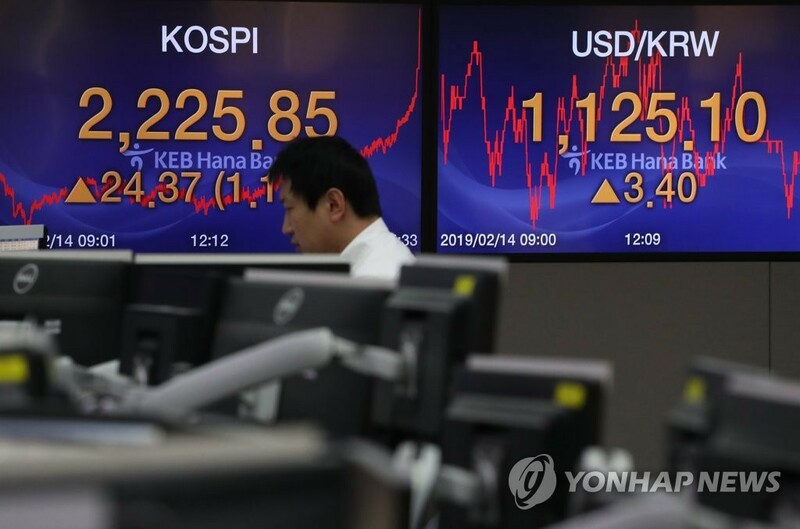 SEOUL, Feb. 14 (Yonhap) -- South Korean stocks closed sharply higher to a four-month high Thursday as investors became more open to risk-taking on optimistic news on U.S.-Sino tariff talks, analysts said. The local currency lost ground against the U.S. dollar. The benchmark Korea Composite Stock Price Index (KOSPI) added 24.37 points, or 1.11 percent, to 2,225.85. It marked the highest closing price since Oct. 10, 2018, when the index ended at 2,228.61. Trading volume was heavy at 561.3 million shares worth 6.28 trillion won (US$5.58 billion), with gainers outshadowing decliners 451 to 368. The index started some 0.40 percent lower as institutional investors dumped massive shares for profit-taking following a three-day winning streak. But after news reports that the White House could extend the tariff deadline on Chinese imports for 60 days, the KOSPI moved up to end trading in positive terrain. "As the KOSPI has been on a roll throughout the week, profit hunting was strong enough to drag down the index in the morning," said Seo Sang-young from Kiwoom Securities Co. "But good news came from the U.S. and spurred an appetite for risky assets." Market heavyweights played a role in extending the KOSPI rally to four straight sessions. Tech behemoth Samsung Electronics jumped 2.81 percent to 47,500 won, and rival chipmaker SK hynix advanced 1.57 percent to 77,400 won. LG Display rose 2.37 percent to 19,400 won, and Samsung SDS, Samsung Group's IT solution unit, gained 1.78 percent to 228,500 won. 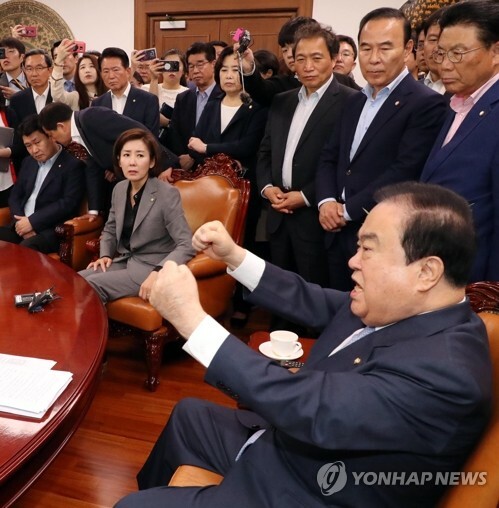 Cosmetics makers were also among the strong winners, with LG Household & Health Care moving up 1.65 percent to 1,233,000 won and Amore Pacific climbing 1.47 percent to 172,500 won. But leading carmaker Hyundai Motor fell 2.41 percent to 121,500 won, and its auto parts manufacturing affiliate Hyundai Mobis slid 0.23 percent to 218,000 won. The Korean won finished at 1,125.1 won against the U.S. dollar, down 3.4 won from the previous session's close. Bond prices, which move inversely to yields, ended higher. The yield on three-year Treasurys fell 0.7 basis point to 1.794 percent, and the return on benchmark five-year government bonds slid 0.6 basis point to 1.864 percent.